So I re-read the whole series and I decided to write my review on the last book so I can give you an overall idea of my feelings on this. 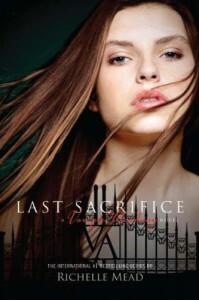 The first time I read the VA I was excited and after the House of Night(I was in my YA period) it was better by far. The second time around I wasn't as giddy. I found Rose's behaviour kind of immature and a little bit slutty but that's probably because I am beginning to forget my teenage years already! Again the first time I loved it, the second it was more lukewarm for me. I thought that Rose used Mason and that she had every reason to feel guilty for what happened to him. I know I'm getting kind of mean but I can't help it. We also begin to understand that under all the "sweet and vulnerable" facade Lisa is so selfish and egotistical. I liked Rose a bit more in this one. She was more mature after her adventure in the second book. I also enjoyed the ghosts side of the story. Lisa again is her selfish self. I loved the cliffhangerish ending. I loved Rose in the fourth book. Absolutely loved her. She was smart, brave, strong. Everything I could want from my heroine. The book is probably my favorite in the series. Rose had to take a dive again and start using Adrian to get over Dimitri. I have to say that I don't like Adrian at all in VA. He gets much better in Bloodlines but in VA he is pathetic and whinny. I liked the story and how they found out more about spirit and the Daskoff's and of course the end was phenomenal. And here Rose drowned for me. She treated Adrian awfully. It wasn't enough that she cheated on him, she had the nerve to try to make him seem like the wrong party in their relationship. Did I love how the things between her and Dimitri worked? Of course I did, but damn Rose and Lisa were both awful in this book. Lisa treated Jil so badly. I can't believe she is supposed to be compassionate and kind. Overall I have to admit that the series is good enough because it keeps you reading, sth very important for me but the female leads are meh. I do love the male leads. Dimitri and Christian are both awesome. Adrian not so much but he gets better. The plot in every book is luckily satisfying and the side characters good enough to balance the heroines.